Last month, the U.S. Department of Agriculture and the U.S. Food and Drug Administration held a public meeting to discuss the use of livestock and poultry cell lines to develop cell-cultured food products. At this meeting, stakeholders shared valuable perspectives on the regulation needed to both foster these innovative food products and maintain the highest standards of public health. The public comment period will be extended and will remain open through December 26, 2018. After several thoughtful discussions between our two Agencies that incorporated this stakeholder feedback, we have concluded that both the USDA and the FDA should jointly oversee the production of cell-cultured food products derived from livestock and poultry. Drawing on the expertise of both USDA and FDA, the Agencies are today announcing agreement on a joint regulatory framework wherein FDA oversees cell collection, cell banks, and cell growth and differentiation. A transition from FDA to USDA oversight will occur during the cell harvest stage. USDA will then oversee the production and labeling of food products derived from the cells of livestock and poultry. And, the Agencies are actively refining the technical details of the framework, including robust collaboration and information sharing between the agencies to allow each to carry out our respective roles. This regulatory framework will leverage both the FDA's experience regulating cell-culture technology and living biosystems and the USDA's expertise in regulating livestock and poultry products for human consumption. USDA and FDA are confident that this regulatory framework can be successfully implemented and assure the safety of these products. Because our agencies have the statutory authority necessary to appropriately regulate cell-cultured food products derived from livestock and poultry the Administration does not believe that legislation on this topic is necessary. Lia Biondo, with the United States Cattlemen's Association shared some thoughts in a live video announcing the decision. "FDA and USDA just issued a joint statement saying that the two agencies are going to jointly regulate foods produced using cell-cultured technology. We've seen a regulatory battle over the last year," she said. The decision for dual regulatory authority is exactly what USCA had lobbied for. "This joint regulatory framework is exactly what's needed. Both agencies have a role to play. USDA regulates meat products." 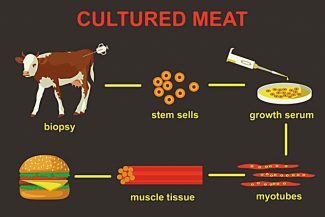 Biondo said her organization believes that if USDA had been allowed to exclusively regulate the cell-cultured protein products, that the products may be allowed to be marketed as meat. They believe this may be part of the reason that some meat companies were lobbying for this approach.